It’s almost a week since I returned from a most amazing trip. I went to Calgary for a few days to see my daughters – my oldest one just graduated from ACAD, one of Canada’s finest art schools, and so there was her beautiful convocation. The trip was full of love and emotions, shared with both my young-lady girls. This trip changed me in ways I can’t really explain. It’s funny how I sensed that coming a few days before, including a change in direction with my art. For the past six months I’ve been thinking about that, how to have my art seen and available beyond the virtual world. Aside from the time with my daughters, I also had time to explore Calgary’s art scene, or at least a few galleries. I met a few wonderful people in the process and I learned a lot, with all of the past half year’s ideas suddenly crystallizing. By the time I left Calgary on Sunday morning I had a much clearer picture of what I must do (want to do) over the next little while, and it’s all quite exhilarating. So was my drive home, all 14 hours of it. I wasn’t looking forward to it, sad to be leaving my grown children. But then as the drive began I started thinking of them, writing letters to them in my head. Before I knew it the trip home was half over. It was such a nice journey, though I had hardly noticed the big sky and rolling hills around me. That soon changed on the second half of the drive, and I have to blame that on the clouds . . . the floating popcorn just beyond my reach, teasing me . . . as if they knew how much I love my popcorn! Quicker than I could spell “cumulous” correctly, it was time for one of those glorious prairie sunsets. Actually, that day (Sunday) was the first time I’d seen the sun since I left home the previous Wednesday. Because I was travelling east the sunset was unfolding behind me, though I could watch it by turning my head 90+ degrees to the left. This can make driving a little dangerous, especially at 120 km/ hour, so I had no other choice to pull over for a while, for a proper view. As soon as I got out of the car, my mind drifted back to when I was five years old. While my dad drove along a very flat stretch of highway, I was fixated on the view, with a lake in the horizon . . . one that looked as big as an ocean. The body of water was in the shape of an inverted triangle, kind of like filling the bottom half of a martini glass. Even as a child it really struck me, how the water seemed to blend in with the sky. That’s when I playfully squinted my eyes to verify the truth of it. But this sunset was even more than that. You see, instead of popcorn clouds, there was this amazing, long narrow strip of cloud in the horizon, much like a blanket. Above this strip was the orange light from the setting sun, and below it was a sea of pale blue sky. In the foreground the gently rolling hills gave the perception that I was on higher ground . . . kind of surreal. It felt like was up on a small island mountain, looking down the hills instead of up, and with the view of a blue cove of gentle water, and with another island far in the horizon. That island was actually the blanket-cloud. It was very a very dark grey given its position, and it was like a silhouette of land a few miles away, across from the cove. If you have followed me for any length of time, by now you will understand how I like to think of nature as an ongoing work of art, though it’s all too effortless to think of it as work. So often I’ve stopped to watch the process, the light and sky changing and picture unfolding. This was certainly one of those occasions. A few days later I painted this picture below, “Prairie Sunset”, based on that part of my trip. However, it really doesn’t exactly show the island scene I just mentioned. That wasn’t the intent. It does seem to depict the warmth of the emotion . . . not just of the sunset, but of the entire trip. And yes, it does seem to have so much to do with love, including some precious hugs for some very precious daughters. 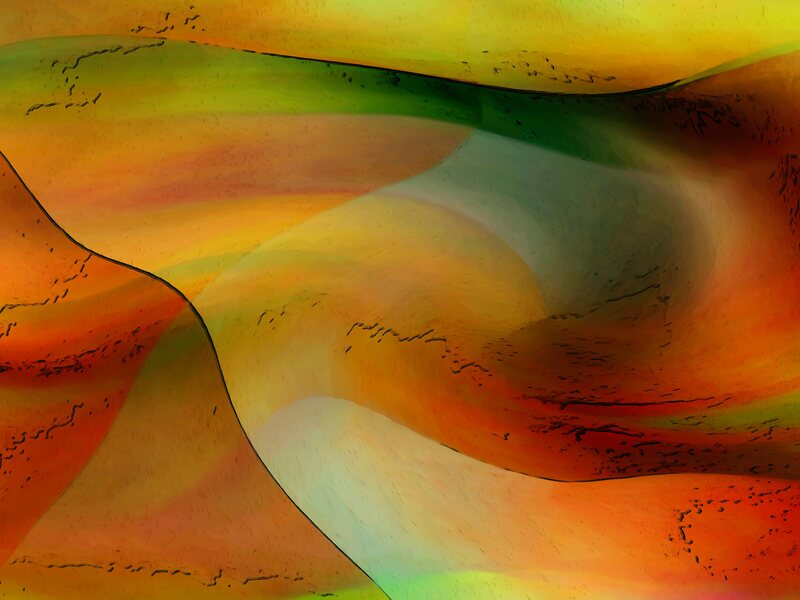 This entry was posted in Uncategorized on May 23, 2015 by Lawrence Grodecki.